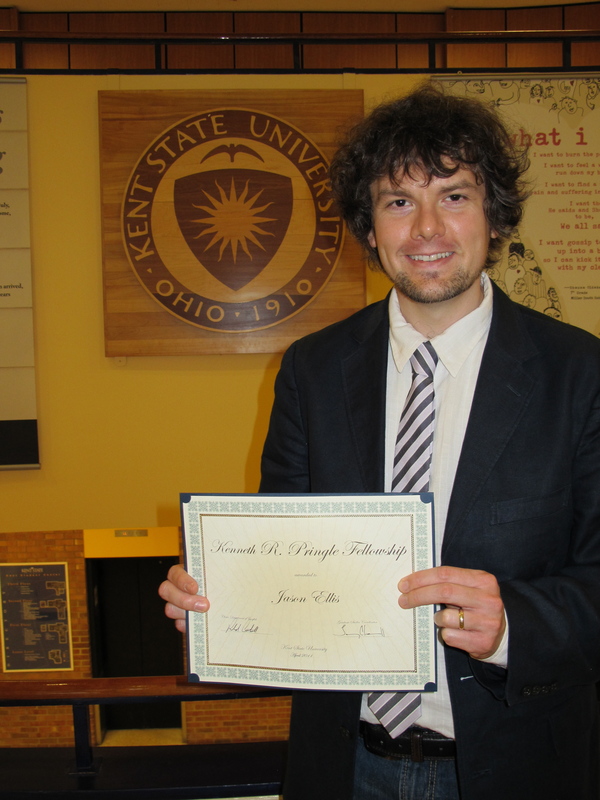 At last night’s Kent State English Department Awards Ceremony, I received a Kenneth R. Pringle Research Fellowship for the 2011-2012 school year. This fellowship gives me a service free semester to focus on research and writing. I plan to use this time, in part, to travel to several special collections to perform research related to my dissertation and a few unpublished articles. The award ceremony was well attended by students and faculty in the English Department. Y and I represented the English Literature PhD students. It was the last ceremony presided over by current Chair Ron Corthell, who is leaving the department after 30 years of service. Professor Donald “Mack” Hassler presented Professor Corthell with an Old English decree (and some good-natured ribbing) for his service to the department. I can attest to the good work of Professor Corthell, because he helped me deal with attacks on my blog publishing as a graduate student (here and here) and with professional issues relating to students. I wish Professor Corthell the best in his future work. Gene Wolfe's "How the Whip Came Back"